Yesterday the British government announced the latest jobless figures, revealing that youth unemployment is now up to 1.2m. The figures also emphasise the need to control immigration - something that only UKIP proposes to do. Last year 280,000 people in the UK lost their jobs whilst 150,000 newly-arrived immigrants found gainful employment. In 2009 the cost of an unemployed person was estimated at £8,000 per year. Someone working 40 hours a week at minimum wage will make an annual contribution to the Treasury of £1,681 in income tax and national insurance contributions, assuming they get no other benefits such as income support or tax credits. Being generous and assuming 50,000 of the 150,000 are skilled professionals and earn an average of double the median average wage of around £20,000 per year, they will pay £10,434 per year into the Treasury - again, assuming they don't claim any other benefits. 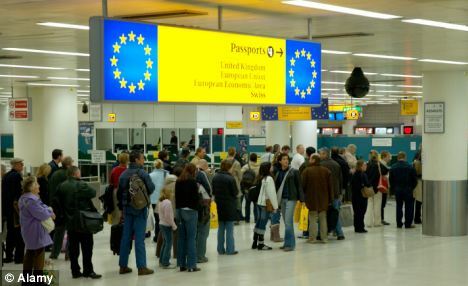 Identifiable public expenditure per person in England is £7,121 per year so each of the 150,000 unemployed people already living here who are claiming unemployment benefits because 150,000 jobs they could have been doing went to newly-arrived immigrants costs the taxpayer £15,121 every year they're unemployed. We don't need immigration. Not economic immigration anyway. We need some people who have skills that are in short supply in the UK but we don't need to import factory workers, taxi drivers, farmers and cleaners - we have at least a million unskilled, unemployed people in the UK who can do those jobs. UKIP policy is to freeze economic immigration for 5 years so that vacancies can be filled by people already living here and then applying a points-based system to control immigration after that point. Labour and the Tories both adopted their own watered-down versions of UKIP's points-based immigration policy but without the absolutely key 5 year freeze and of course without applying it to immigrants from EU states. Almost two thirds of the 150,000 newly-arrived immigrants who secured jobs - 93,000 people - were from the 2004 EU ascension states of Cyprus, Czech Republic, Estonia, Hungary, Latvia, Lithuania, Malta, Poland, Slovakia and Slovenia. While we are in the EU we have no way of limiting the number of people coming from EU member states to live and work here and when they do come they have to be given the same benefits as people already living here - the same social security benefits, the same access to social housing, the same access to the job market, the same access to health and education services. All of the services that workers have been paying into for decades only to find them under-funded and over-stretched when they need them. The message that these figures send out is clear and loud - there aren't enough jobs to go round the people who already live here, we don't need any immigrants.